Picture courtesy of Atholl Fraser, Scotland. 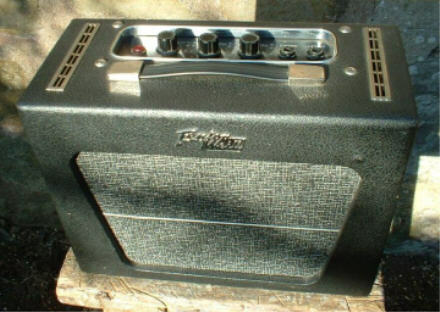 The Hornet appears to have been smaller version of the Cadet, cosmetically similar, but without a tremolo circuit. It was however equipped with separate volume controls for each of the two inputs, governed by a single tone control. Probably produced at the same time as the Cadet i.e. late 1963 to late 1964. Valve line-up 1 x ECC83, 1 x EL84 and 1 x EZ80; and a single 6" speaker.